You’ve likely heard this from countless professors, teachers, friends, and family members, but everyone experiences nervousness. It’s the result of our animal instincts, our fight or flight response, and it’s natural. The solution is simply to gain experience. Think of each instance of nervousness as a new chance to conquer and control the sensation. After enough repetitions, nervousness will no longer seem like such a big deal, just an expected and regular part of performance. Nerves will probably never go completely away, but by the time you get to a huge concert you’ll be getting used to it. Whether you like it or not, self-advertising, or creating your own brand, has become more and more doable thanks to the Internet. Read up on creating a web presence. Unless you’re famous, you’re going to need to market your talents. Sites like BandCamp and SoundCloud tend to be synonymous with popular music, but this trend is slowly changing. In fact, many classical musicians are uploading recordings of their gigs to SoundCloud. On top of the benefits of a clean, easy to navigate repository of gig recordings, having a SoundCloud is like having a deluxe portfolio. What do I mean by “deluxe”? Well, it’s like having a resume with a built in audience of employers ready to look at it 24/7. And SoundCloud isn’t just a social network; it’s a social network of people who actively create and/or listen to music. Keep tabs on ongoing events at your university. Many students and faculty would love to have their events spiced up with some “sophisticated” music. There are plenty of fundraisers and galas that are always looking for entertainment. It even gives them a bragging point to have a student performing and could lead to more donations for the school. Music education is an important aspect of many children’s lives, and choosing an instrument to pick up can be quite a meaningful decision, even if it may seem superfluous to us at the time. Check with local elementary schools to find out when they start their students off in band and orchestra programs. They may very well be looking for people to come in and explain and play their instruments to students. You never know when you could be the one to inspire the next great performer. 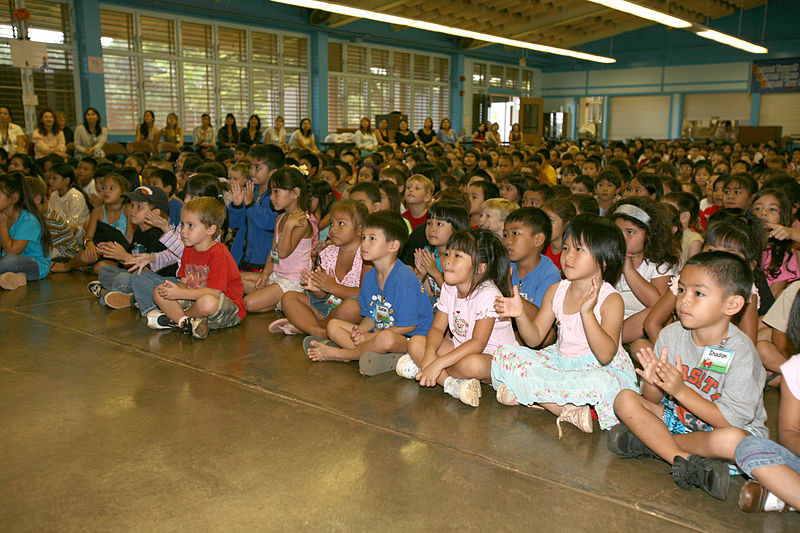 Children from Kaneohe Elementary School clap to the beat of one of the many jazzy songs the US Marine Corps Forces Pacific Party Band played during their performance as part of the Music in the Schools program. Photo in the public domain via Wikimedia Commons. Playing at a retirement community may not be very glamorous, but it will leave you with experience and the feeling that you’ve done a good service. One of the most rewarding times of my musical career was playing at a nursing home. A deaf woman rolled her wheelchair up to my marimba and put her hand on the side to feel the vibrations. Seeing her smile is something I will never forget. To me, this small gig was right up there with playing in Orchestra Hall in Chicago. A gig at a barber shop didn’t give me a huge audience, but it’s not always the size that matters. Through it I was able to meet some people from a mattress store called Dr. Snooze, and eventually led to me getting to play at one of their open houses. I met several more people through it that led to even more performance opportunities, including corporate retreats and even a wedding. I can also use them as a reference when telling others about my music. It’s amazing how one “little” gig can turn into so much more. Now you should look into the legality of this strategy before pursuing it, but playing in the street (even for no money) can be an incredible source of publicity. Who knows who might be looking? It also helps to strategically pick your location so that people who might be more likely to need musicians may listen. Another idea you could try would be to upload recordings of your performances to YouTube to be able to show them to others. 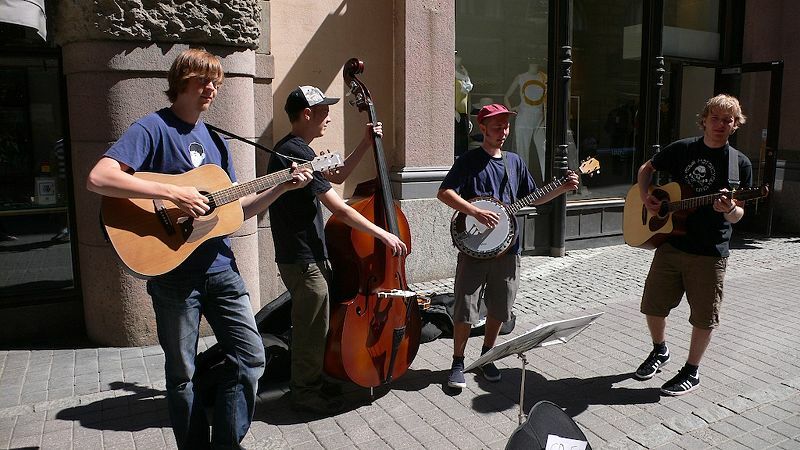 Finnish bluegrass buskers in Helsinki, Finland. June 2006. Photo by Cory Doctorow from London, UK. Creative Commons License via Wikimedia Commons. All of these ideas will give you some great experience and help you become a better musician. And when you come to the bigger events, you’ll be well prepared. This really is informative. Applicable to every student of any ages. The “Don’t let nerves get in the way of gigging” is a powerful advice. Because no matter how good a music player you are, if nerves got got in the way, everything will crumble making you look like you never practiced at all. I’ve been looking for ways to use the music lessons I had as a kid in my life now. I love your idea to play in a retirement home because people who live there are often lonely, and music can help lift their spirits!